Black oystercatchers live in a cruel and dangerous world. Within 30 minutes of monitoring I saw a black oystercatcher couple scare off a young black oystercatcher, have an aerial battle with a crow, and have their nesting area disturbed by two young men. But who can blame us? Beautiful places like this tend to awaken the adventurous spirit within all of us. Let’s remember though, that we can recreate without disturbing the wildlife that live in these beautiful places. *Who wouldn’t want to adventure through the water into the center rocks, right? Rick Hanks, who works with the California Coastal National Monument, monitors the black oystercatcher couple that live in the center rocky area surrounded by water. While this location provides protection from terrestrial animals, a few years back during low tide, Rick saw a pair of canine tracks that led to the nesting area and then led back to the trees. Rick searched for the fledglings, but they were nowhere to be found. And of course black oystercatchers are vulnerable from an aerial ambush. 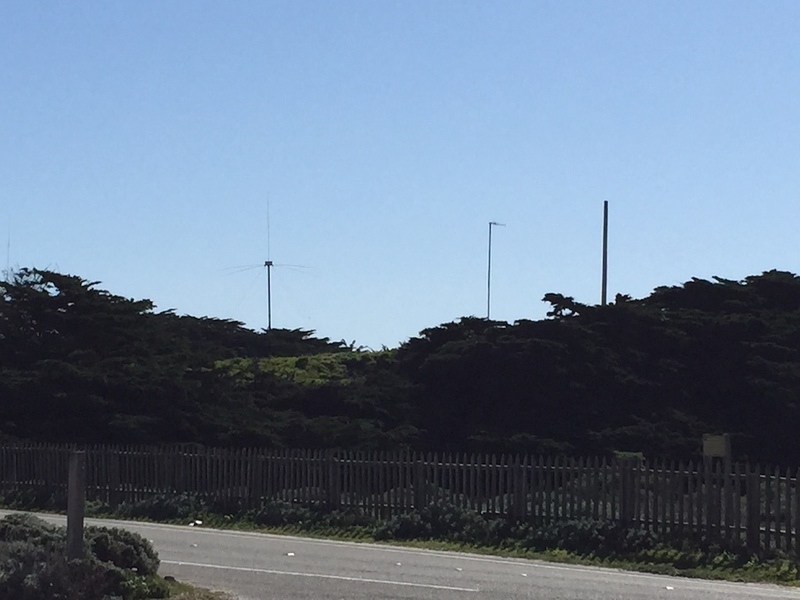 In another nesting disaster a hawk silently and patiently stood on one of the polls that are across the beach. There the hawk waited until the fledglings were large enough. Worthy for it to consume. Only a foot and entrails were found. Finally, we humans often pose a threat to not only black oystercatchers but other animals. While we don’t do it on purpose the added stress we cause to an animal is extra energy wasted that could be fatal in the outside world. So next time you see a sign like this just enjoy the view from a distance. The title of this blog post was inspired by someone describing the way a Black Oystercatcher looks as a crow eating a carrot due to their dark plumage and their long bright orange bill. Now that the shorebird surveys are over I’ve started to get involved in helping to monitor Black Oystercatchers and their nests. This monitoring will help towards gathering data about the Black Oystercatcher’s reproductive success. These particular birds seem to be facing quite a bit of challenges. Their range falls within the rocky intertidal, which means that they might be facing habitat loss due to climate change. While nesting, they also face the danger of predators including gulls and crows. This project is being led by Hugo Ceja, the Monterey intern from last year. He has a network of volunteers helping to monitor the nests at various locations around the Monterey Coast. Hugo has become quite the expert on anything Black Oystercatcher-related, so I’ve been trying to soak up as much information from him as possible. So far I’ve gone out with him to the sites a few times and I’m always amazed at how much he knows about the Oystercatchers and their behaviors. I am also surprised at his ability to find the nests that he is monitoring in the first place because they are so very well camouflage, inconspicuous, and often times far away. The first thing I learned about the Black Oystercatchers is that they are very territorial amongst their own species. A pair of Black Oystercatchers will claim a territory and will chase any interlopers that come into their territory. From my own observations out in the field I’ve noticed that this is behavior might have to do something with their troubles reproducing. When an outside Black Oystercatchers comes into the territory often times the Black Oystercatcher that is on the nest will get off the nest and join the chase as well. Predators will take advantage of this situation. This past Tuesday there was a pretty close call when a nesting pair of Black Oystercatchers went off on a chase and a gull got really close to the eggs and was looking down at them. Luckily, one of the Oystercatchers came back just in time. Another thing that I’ve become quite familiar with is the Black Oystercatcher’s calls. They have a very distinct calls and it is rare that they fly without making a call, making it somewhat easier to locate them. The kind of observations that are of interest to this monitoring include: nesting behaviors, incubation exchange, the fledging of the chicks, and any significant observations of predators as well. I’m excited to learn more about the Black Oystercatchers and I’m hoping that this data will lead for them to receive a special status if their populations are actually in trouble. While this season has already been plagued with lost eggs, I’m hoping that the other pairs will pull through and raise chicks successfully! This pair is nesting very closely to a nesting gull. The only remains of one particular BLOY nest. Another BLOY sitting on their nest. A BLOY chick! Very well camouflaged. Nesting behavior from this pair: cleaning up a spot for a nest. On Saturday the 31st I was able to tag along on a bird walk in Seaside, CA. 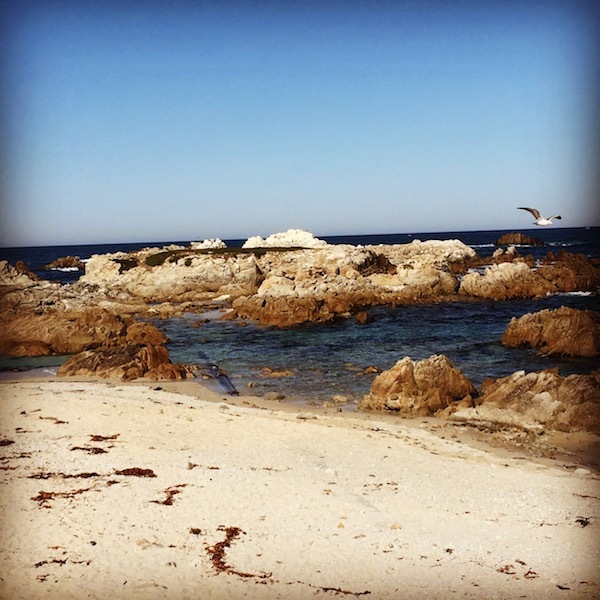 I heard about the bird walk from last year’s Monterey intern, Hugo Ceja. 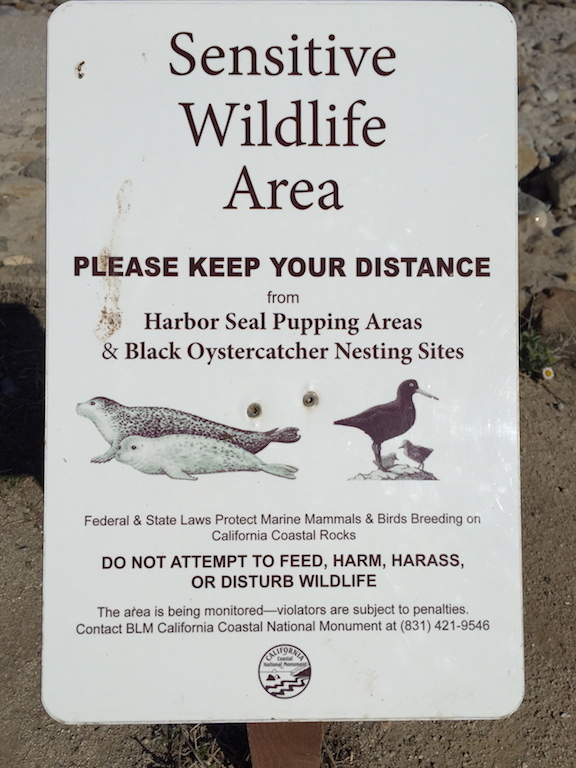 The person who led the walk, Celia Bosworth, is going to be volunteering with Hugo doing some Black Oystercatcher monitoring in the Pacific Grove/Monterey area. We all met at the Seaside County Library at 10 AM. There I was able to meet Celia and some of her other volunteers including a Spanish/English interpreter and a leader from the Boys & Girls Club. I was pleasantly surprised at how many kids and their families showed up to the event! It was a really good turnout. There were about 25-30 people in total. The majority of the children and families that participated were Latino so I was able to speak in Spanish to mostly everybody! Before walking to Laguna Grande Regional Park, Celia gave some quick pointers in both English and Spanish on how to use binoculars and then we handed them out to the children and their parents. After handing out the binoculars we headed off to the park which was virtually across the street. Once we got to the park we were able to see some ducks and geese almost immediately. There were a lot of Canada Geese present as well as some Mallards. We lucky enough to see a mom Mallard and her little ducklings! That was exciting for me because it was the first time that I saw ducklings! There were also Barn Swallows flying over the pond which was pretty neat because they have an iridescent blue hue to them that is always nice to observe. The kids were very interested in learning the names of the birds, and Celia was also very knowledgeable of the birds’ names in Spanish so she was able to share the Spanish names with us too. Aside from the geese and Mallards we also saw a couple of blackbirds, some crows, and we were also able to get a really nice close-up view of a Double-Crested Cormorant. While we were all observing the cormorant a Great Blue Heron landed right next to it! That was probably the highlight of the bird walk, having the Great Blue Heron making a surprise appearance was really neat! Some challenges that I encountered during the bird walk included some of the kids chasing the Canada Geese. I didn’t really know how to tell them not to do it without sounding like an old grouch but I just tried explaining that they were probably scaring them and stressing them out. Some of the kids were picking up bird feathers. I explained that they probably had a lot of germs and that birds often carry diseases so it might be better to just leave the feathers. Overall it was a really great event. I was able to meet a lot of new people. The best part was seeing how interested some of the kids were. I hope that this event was able to spark an interest for the outdoors and maybe even for birds! It was great that Celia organized with event. At first I was under the impression that Celia was a teacher but soon learned that she works in healthcare and she was partaking in this event because of her love for the outdoors. She also explained that the Spanish version of the Kaufman bird guide inspired her to start doing these bilingual birds walks. Celia is truly an inspiring person and I hope she continues to organize more events like this because it brought a lot of happiness to everyone who participated! On Saturday May 10, 2014 Carlos and I participated in a bird walk being hosted by the Watsonville Wetlands Watch program, an organization that advocates for wetland issues. We started the day by meeting up at the Fitz Wetlands Educational Resource Center, a neat center with lots of educational resources. At the Fitz Wetlands Educational Resource Center we were able to meet all other people who were going on the bird walk, including the event organizer Debbie Diersch. Before carpooling out to the different locations we discussed the different places we would be going to and talked about which birds we might see at the different locations. Soon after we headed out to our first destination, Harkins Slough. As we walked down to the slough we were able to see a lot of Red-Winged Blackbirds in the nearby strawberry fields. We also saw a couple of different sparrows. Fortunately, a tiny shorebird also made an appearance! We spotted a killdeer next to the strawberry fields just hanging out on the ground; it seemed to stay there for a really long time so we began to wonder whether it had a nest there. As we got closer to the slough we saw some majestic white pelicans flying overhead. The highlight of Harkins Slough was seeing an osprey nest! I was able to see a head poking out of the nest but I wasn’t sure if it was one of the parents or if there was already a chick present. The next location we went to was on Lee Road, a road that was also adjacent to strawberry fields. From this road we were also able to see more American White Pelicans and Great Egrets. From this location we were also able to see a Bald Eagle! Across the slough they are nesting on some tall trees, maybe Eucalyptus, so we were able to set some spotting scopes. It was my first time seeing Bald Eagles in the wild so that was pretty exciting! The last location we went to was also really neat. We were able to see a lot of different ducks. We also (barely) saw some Marsh Wrens. We also saw a Black-Crowned Night-Heron! The bird was overall really fun! I think it’s always fun to go out with people who share a common interest and with people who all bring different levels and types of knowledge. I really enjoy being around birders because I feel like I learn a lot from them, so it is always a rewarding experience. I hope to learn more about the Watsonville Wetlands Watch program and maybe get involved with some of their projects!